The 2013 SXSW Film Festival in Austin, Texas has wrapped up this weekend. Winners for the audience awards at the festival were unveiled, along with the jury prizes given out last week. The big winner - a film called Short Term 12, directed by Destin Cretton, whose feature debut was I Am Not a Hipster, one of my favorite films of last year. Short Term 12 took home the Grand Jury prize for Narrative Feature, and went on to win the Audience Award as well, a similar double win just like with Fruitvale at Sundance earlier this year. As for docs, Josh Greenbaum's The Short Game took home the audience award. Full lists below. For more info on the Austin-based festival or this year's winners, visit SXSW.com/film. 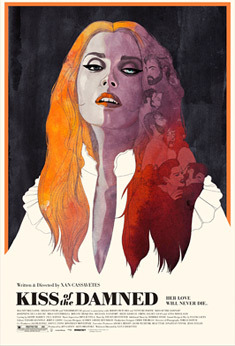 We've included that image of that double-award-winning Kiss of the Damned poster design above, for reference (via SXSW), since it's something that needs to be seen to be appreciated as both the audience award and jury winner. The 2013 SXSW Film Festival hosted a total of 133 features, consisting of 78 World Premieres, 13 North American Premieres and 9 U.S. Premieres, with 76 first-time directors. One of our good friends Eric Lavalle of the site IONCinema was on the narrative comp jury this year, and helped picked Short Term 12 to win. The teaser image is also from the film, starring Brie Larson as a supervisor at a foster care facility.